Man’s best friend deserves the best and that is why you should look no further than these made in America dog beds for large dogs. We have a link to all the available American made dog clothes and accessories but in this article, we will introduce you to the most popular extra large orthopedic dog beds. 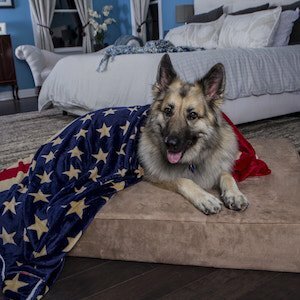 If you are not sure of the importance of buying products made in the USA, please visit our main site where we make a very compelling case on the virtues of buying American products and in this case, American made dog beds for large dogs. This dog bed is precisely engineered to provide perfectly distributed weight support for extreme comfort & durability. Looks like a beautiful piece of furniture, feels like a high end velvety couch on your skin. Easy to clean, just unzip the machine washable cover. Made with 7″ of American Made therapeutic foam, the same foam used in expensive furniture. Supports every curve of a big dog’s body. Big dogs don’t sink through the bed, full grown humans feel comfortable laying on a Big Barker. Won’t flatten. The famous Big Barker foam will retain at least 90% of its shape & support for the next 10 years guaranteed! Most dog beds for large dogs are mass produced in a factory & use Chinese-made foam. They’re less expensive, but you’ll quickly feel the difference. Cheap memory foam dog beds flatten quickly, you’ll be buying a new bed shortly. Plus, fillers have been found in imported foam. You don’t want your dog sleeping on toxins. These American made dog beds for large dogs are built with the care your dog deserves. Vets will tell you that up to 80% of large dogs will suffer from joint pain as they age. Big Barker offers total joint support. Uniquely engineered to keep dogs youthful for longer, and bring older dogs back to their best. Big Barker will only ever make beds in America using American made foam. Our reputation is our most important asset. We only trust American workers and American materials to give your dog the care they deserve. Since 2012, Big Barker beds have been put to the test in the homes of over 50,000 loving pet parents – and passed with flying colors!